The 1940s began with Britain plunged into the Second World War with Germany. The war period was one of great austerity, with shortages of every kind. The toy industry was subject to the same restrictions as other industries and rationing continued long after the war ended. The government launched the Utility scheme in 1941 to ensure that good contemporary design went hand in hand with economy of production. In reality most children played with toys which had been handed down from older children or made at home. Where possible, some firms, such as Nicol Toys, were able to continue production throughout the war as long as they were permitted access to materials. Plimpton Engineering, the manufacturers of the construction set Bayko, used aluminium or tinplate instead of steel for the rods in the kits, less consistent colour and very crude packaging. By the end of 1941 however the works had gone over entirely to the war effort, producing goods including parts for Wellington bombers. Others were unable to survive, with companies such as the The Teddy Toy Company, set up in 1914, winding up in 1951. Raw materials were rationed until long after the war was over as almost everything was used in the war effort. Teddy bear firms also helped with the war effort, such as Dean’s Rag Book Co. who made life jackets. Chad Valley made children’s clothing and Merrythought made military uniform accessories. Soft toy makers tried to continue making their products, but even teddy bears had to get slimmer because they had less filling. Due to this the general shape of teddy bears and other soft toys began to change; limbs and muzzles became shorter, necks were unjointed. Other major toy manufacturers played their part in the war. Lines Bros. made gas masks and military supplies for army training for most of the period. Production at Britain’s continued until 1941 when it began making munitions. After 1945 it returned to the manufacture of toy soldiers and other toys but with limited output due to labour shortages. From 1942 metal was completely banned from use in toy making. Meccano’s familiar red and green paint vanished until after the war and only plain sets were available. Another old established firm, Brookes and Adams, founded in 1853 making medals and badges, installed with great foresight a plant for the production of plastic products in the late 1920s, in an attempt to diversify. The first plastic article that it made for the toy market was the Bandalasta ‘Playtime’ tea and dinner set that it made through the war period, after which it went on to produce games equipment. The sets were highly unusual at the time, with earthenware being the more usual material. After the war new toy firms began to spring up and the home industry began to grow. The British Toy Manufacturers’ Association was started in 1944 and it organised a Toy Fair which was held in Brighton for many years. In 1947 Leslie and Rodney Smith formed Lesney Products, taking on a third partner, Jack O’Dell, before long. At first they made pressure die-cast products and from 1954 small replicas of real vehicles which they sold in small boxes under the trade name Matchbox. The idea of the matchbox as a container is said to have been inspired by Jack O’Dell’s daughter, who took one of the cars to school in a small box and triggered a demand for the new product among her friends. It took off and new ranges of cars were added including the Superfast models in 1969 and Yesteryears in the 1970s. Matchbox was hugely successful in the export market. Unfortunately, fire and flood destroyed much of its Rochford factory in the late 1970s, and coupled with considerable competition from other manufacturers Lesney became bankrupt in 1982. It was taken out of receivership by Universal International of Hong Kong, then the Matchbox brand was acquired by Tyco Toys, who were subsequently taken over by Mattel in 1997. Postwar Britain was mad about sport and any amusement connected with it was welcomed. The Subbuteo Sports Games Ltd was formed in 1947 by Peter Adolphe who revised a table football game originally designed in the 1920s as New Footy. Adolphe had wanted to call his game The Hobby, but was unable to licence this, so settled on the Latin name for the falcon also called the hobby – Falco Subbuteo. Made from flat wire, netting and card and played on an old blanket or piece of board, the game was cheap to produce. 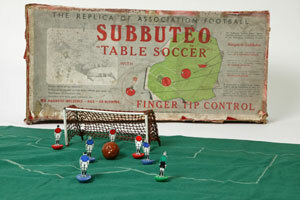 Subbuteo remained in production until the end of the 20th century. 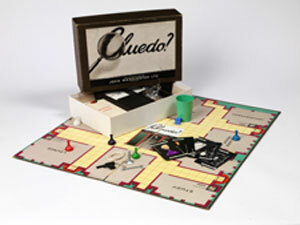 Cluedo is another of the post-war toys now regarded as a classic. Introduced in 1949 the early sets featured quite a plain design and came with the playing board and a separate box for the accessories, before being redesigned in 1965 and 1972. Although materials continued to be difficult to obtain for some years, the potential of the new synthetic fibres as useful and economically priced replacements for silk boded well for the future of soft toys. Other toys such as Bayko started to become available, although complete sets were not made until 1946. In the 1945 issues of the Games and Toys magazine, Kiddicraft proudly announced that their “Plastic Educational Toys, in pre-war form, are now available again in limited quantities”. 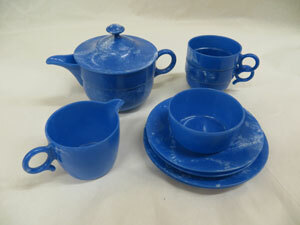 Experiments with plastics had been conducted throughout the 1930s and continued in the 1940s, resulting in revolutionary new injection moulding techniques developed by British Xylontine. This was to become the standard method used for all plastic production. The late 1940s was a time when the government had determined to offer the people a more secure and promising future. 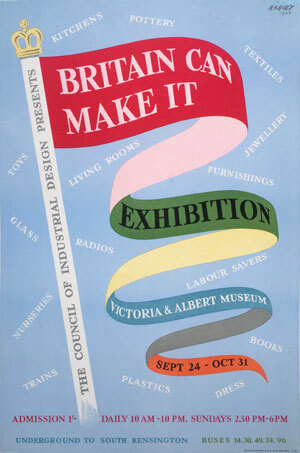 The Butler Act of 1944 made secondary school education mandatory, the National Health Service was launched in 1948 and the Victoria and Albert Museum held the Britain Can Make It exhibition in September 1946, which included toys. Toys had to play their part in the re-birth of Britain as vital exports and also as educational tools. New materials would ensure that the toy industry kept up with the competition at home and, increasingly, from aboard. Post-war British society was about to experience the beginning of the consumer age. The influence of the US and the Far East on British popular culture, already underway by the 1930s, was about to expand very rapidly with the arrival of the television set in most British homes during the next decade.